The first therapy intended to allow for the production of an internally truncated dystrophin protein for patients with DMD. IS YOUR PATIENT AMENABLE TO EXON 51 SKIPPING? 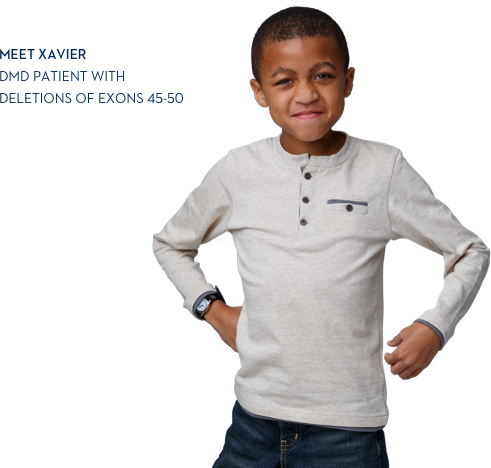 EXONDYS 51 is for patients with a confirmed genetic mutation that is amenable to exon 51 skipping.1 For exon skipping to work, exon 51 must be present. See the list of common DMD deletions that are amenable to exon 51 skipping. GET THE LATEST UPDATES FROM SAREPTA. Sign up for news from Sarepta Therapeutics, including product updates, reimbursement information, and services that may be of interest to you and your patients. 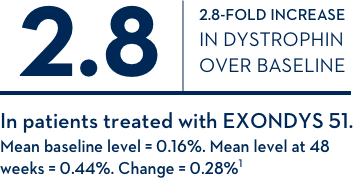 EXONDYS 51 is indicated for the treatment of Duchenne muscular dystrophy (DMD) in patients who have a confirmed mutation of the DMD gene that is amenable to exon 51 skipping. This indication is approved under accelerated approval based on an increase in dystrophin in skeletal muscle observed in some patients treated with EXONDYS 51. A clinical benefit of EXONDYS 51 has not been established. Continued approval for this indication may be contingent upon verification of a clinical benefit in confirmatory trials. Hypersensitivity reactions, including rash and urticaria, pyrexia, flushing, cough, dyspnea, bronchospasm, and hypotension, have occurred in patients who were treated with EXONDYS 51. If a hypersensitivity reaction occurs, institute appropriate medical treatment and consider slowing the infusion or interrupting the EXONDYS 51 therapy. Adverse reactions in DMD patients (N=8) treated with EXONDYS 51 30 or 50 mg/kg/week by intravenous (IV) infusion with an incidence of at least 25% more than placebo (N=4) (Study 1, 24 weeks) were (EXONDYS 51, placebo): balance disorder (38%, 0%), vomiting (38%, 0%) and contact dermatitis (25%, 0%). The most common adverse reactions were balance disorder and vomiting. Because of the small numbers of patients, these represent crude frequencies that may not reflect the frequencies observed in practice. The 50 mg/kg once weekly dosing regimen of EXONDYS 51 is not recommended. In the 88 patients who received ≥30 mg/kg/week of EXONDYS 51 for up to 208 weeks in clinical studies, the following events were reported in ≥10% of patients and occurred more frequently than on the same dose in Study 1: vomiting, contusion, excoriation, arthralgia, rash, catheter site pain, and upper respiratory tract infection. Please see the full Prescribing Information for EXONDYS 51 (eteplirsen). EXONDYS 51 [package insert]. Cambridge, MA: Sarepta Therapeutics Inc; October 2018. US Food and Drug Administration. 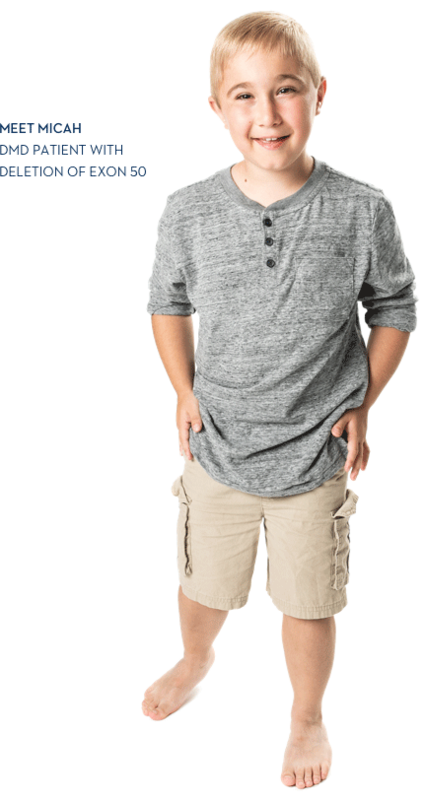 FDA grants accelerate approval to first drug for Duchenne muscular dystrophy. https://www.fda.gov/newsevents/newsroom/pressannouncements/ucm521263.htm. Published September, 2016. Accessed June 1, 2018. National Institutes of Health. National Library of Medicine. Genetics Home Reference. “Duchenne and Becker Muscular Dystrophy.” http://ghr.nlm.nih.gov/condition/duchenne-and-becker-muscular-dystrophy. Reviewed November, 2016. Accessed June 1, 2018. Schnell FJ et al. Development of a Validated Western Blot Method for Quantification of Human Dystrophin Protein. Poster presented at the 21st International Congress of the World Muscle Society; October 2016; Granada Spain. EXONDYS 51, Sarepta, Sarepta Therapeutics, and the Sarepta logo are registered trademarks of Sarepta Therapeutics, Inc. The EXONDYS 51 logo, SareptAssist, the SareptAssist logo, and "Support, By Your Side" are trademarks of Sarepta Therapeutics, Inc.